A quick and dirty (and incomplete) list, since it’s taken me two months to get to this. Breweries are in a separate post. Shigezo – An izakaya – I had an amazing sizzling rice bowl. Cheese & Crack Snack Shop – I had heard about this place on a blog I read a couple of years ago, and it stuck in my head. 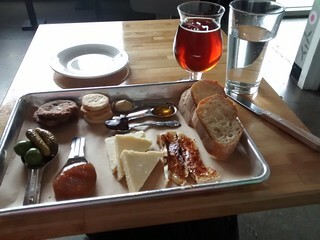 A cheese plate as my meal? Yes, please! Powell’s City of Books – Gotta do it! Cavernous and maze like, and a bit too much to take in. Next time I’m in a city with a famous bookstore like this, I need to go in with a couple of titles in mind. Staff were overheard discussing how they needed to figure out in advance when a librarian convention was coming to town, as we sold them out of books by the keynote speakers immediately upon our arrival in town. 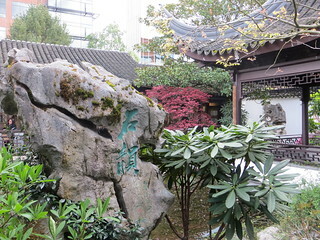 Lan Su Chinese Garden – A traditional Chinese garden in the middle of downtown. A very pretty spot. Voodoo Doughnut – I was overwhelmed by choice, but since this was my breakfast I did not have the peanut butter oreo doughnut. I kind of wish I’d gone back for it. 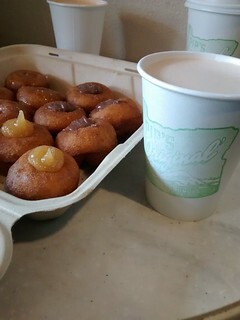 Pip’s Original – miniature doughnuts and several types of chai. Tiny, packed, delicious. Zell’s Cafe – Great spot for breakfast that took me on a lovely walk through the neighborhood. Ristretto Roasters – A spare, quiet coffee house where I had a tasty cappuccino. They had some pastries, but not a lot of other food options, at least for breakfast. Mio Sushi – On a side street in a shopping district we wandered around for a bit. Pretty good! Grendel’s Coffee House – A very comfortable and casual coffee shop with good breakfast options. Noble Rot – Elegant and delicious wine bar a few floors above ground level, with the standard “small but well curated” beer list. McMenamin’s on Broadway – An institution in the Pacific Northwest. This was a great place for lunch after my training session, especially since I could sit on the covered back patio. Here We Go Again – Consignment spot that was an excuse for a long, rambling walk around Portland the day after arriving in town. Very friendly staff and great stuff.